Following this purpose members of the Association have established a long tradition of reaching out to other’s in the community to promote interest in to stimulate study of Hopkinton’s history. For many years HHA has had a volunteer presence at the achieves room at the Langworthy Library in Hope Valley. These folks are there on Wednesdays from 10 a.m. to 3 p.m. to answer questions about the town’s history or to set people on a path of geneological discovery. Several times a year we offer programs to the public, usually at no charge, highlighting historical events or places in town or nearby. These will be listed on our events page as they come up. This brings us to our newly created website, that has brought our tradition of Educational Outreach into the 21st century! Also, several of our members have written books about Hopkinton and eventually we hope to be able to make these available for purchase on our website. The article that follows is another aspect our Educational Outreach program. The HHA “Historic” bus tour for elementary school students has been a tradition for the past 5 years. This article appeared in the CHARIHO TIMES on Thursday November 8, 2012. That’s what she told Hope Valley Elementary School student on October 26, when she led the school’s annual Hopkinton Historical Association Tour for the last time. That’s a lesson she wanted to pass on to the young learners of Hope Valley – listen, ask your relatives, and write it down. Each year fourth grade students of Hope Valley Elementary put textbooks and quizzes aside for a day to experience the hands on history of the Hopkinton Historical Association Tour. Their social studies teacher, Denise Foggo, knows the value of hand-on learning. She works part-time for the Rhode Island Historical Society and participates in Revolutionary War reenactments, and she has coordinated the schools historic tour for years. “Every year we improve upon it, Foggo said. This year’s tour was their longest yet, she added, starting at 9:30 a.m. and ending at 2:30 p.m. at the grave of freed slave Amos Augusta. Of course like any 9 and 10 year olds, Foggo’s students were eager to get out of the classroom, clomping though the autumn leaves as the trekked down Main Street, but the history took center stage. 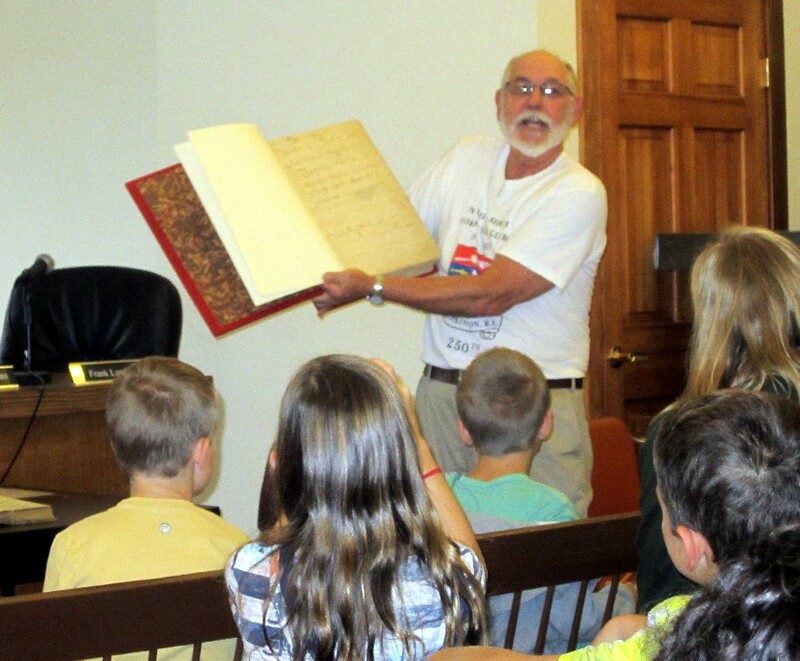 At each stop the boys and girls dutifully jotted down note on their clipboards, while Andrews and Richard Prescott from the Hopkinton Historical Association introduced the towns famous people and places. He may have been right to feel that way. Along this exhaustive tour, students learned theatrical presentations in Barber Hall, heard stories of churchgoers riding a horse and buggy to the First Baptist Church and discovering that Avery Funeral Home is the oldest business in town with its original name – and that was just the first hour. But Andrews has a knack for telling the stories that will hold a child’s attention, like when she told the class about the 137 flavors of ice cream served at Greene’s Ice Cream Shop, which included “celery”, “pond lily”, “sea moss”, “elderberry” and “sweet potato”. Every so often she dug into her “Mary Poppins Bag” for a surprise – a jar of dirt with iron filings from the ground near the old iron mill, or the wooden mold for a wrench as long as her arm. At Depot Square on Main Street, the student could read Andrews’ words carved into stone on the “Talking Wall”, alongside the quotes of other well-known Townspeople throughout the years. Andrews has reason to know this history – Capt. Nichols was her great-great grandfather. When Nichols’ granddaughter, Lucy, married Charles Greene of the ice cream shop, they had a son named Chauncey, who was Andrews’ father. “As I’m the last in the family line [who knows these stories] …. I’ve always felt an obligation to keep these stories alive all my life for the young children and my own children, grandchildren and great grandchildren,” Andrews said. The stories Andrews and Prescott told are the kind that don’t come in books, as the students of Hope Valley Elementary discovered. One boy, Zachary, leaned that his family lives in the house once owned by the town’s toll keeper. Another, Jack, had his curiosity piqued by the famous tree growing outside the home of Gen. George Thurston, who had fought in the Revolutionary War and had planted the tree in the late 1700s. After 30 years of telling stories, Andrews will now hand over responsibility to someone else, but the history of Hopkinton will live so long as the students remember what Andrews taught them – listen to your relatives , and write it down. The Hope Valley Elementary School fourth graders with their parent volunteers at Depot Square Park. At left Hope Greene Andrews and Richard Prescott from the Hopkinton Historical Association, with Hope Valley teacher, Denise Foggo, the fourth grade social studies teacher who coordinates the event each year. 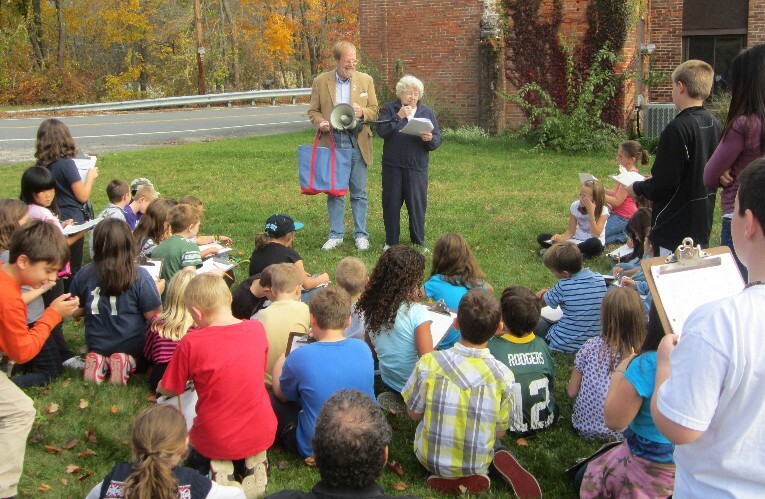 Hope Greene Andrews addresses the fourth grade students in front of the former Nichols & Langworthy Machine Shop on Mechanic St. Pastor Tom Wallis of the First Baptist Church of Hope Valley is holding her microphone.